Summer is a great time to explore B.C., with the many outdoors activities and festivals. While some will make the drive straight to Vancouver, the more enlightened traveler will stop by and visit Abbotsford, which is the largest city in the Fraser Valley. According to Destination B.C., Abbotsford is known as the "City in the Country" for its agricultural, hospitality and outdoors activities. Abbotsford is nestled on flatlands between the Coast and Cascade mountain ranges. 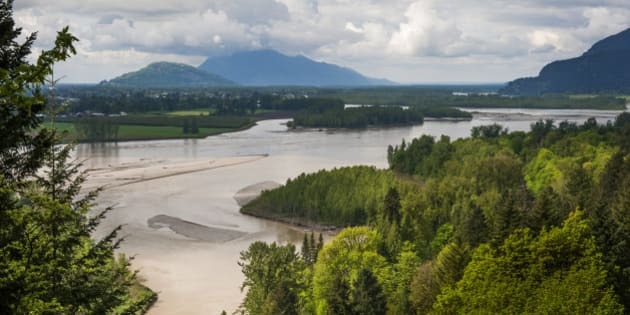 With a burgeoning population of approximately 143,000, Abbottsford lies in the heart of the Fraser Valley, 68km east of Vancouver and just 5km from the US border. While Hwy 1 connects the community east and west, its airport has put Abbotsford on the international map. Abbotsford is an alternate arrival/departure point to Vancouver's International Airport. The Abby Grind is like the little sister to North Vancouver's Grouse Grind. This was our first time hiking the steep Glen Ryder Trail that reaches the viewpoint in about 45 minutes. The 4km trek and can be a challenge if you're not wearing the proper shoes, though on this sunny day runners and walkers with their dogs enjoyed the trail as much as we did. The Abby Grind has been around since 2013 and offers a great workout. Steep though it is, there are sections that level off, allowing one to rest. We started out walking around the paved pathway and boardwalk that encircles beautiful Mill Lake Park in central Abbottsford but ended up running parts of the two kilometer path. Mill Lake is a popular trail that attracts everyone, with picnic tables, a playground and water park. Photo ops abound with spectacular views of Washington State's Mount Baker. A fun fact: did you know that Mill Lake Park is the Jewel of Abbotsford because of its rich history, having the first saw mill built there in 1903 and which remained active until 1934. After our workout we were welcomed to lunch by friendly staff at the Harvest Grill n Greens in downtown Abbotsford. It's a one-of-a-kind eatery in which owner/chef Dion Brisson presents a varied menu of all healthy choices for the vegan and meat lover alike. It's comfortable, bright and super clean, built in part with 100-year-old cedar beams that were discovered under the original building by Dion's friend and carpenter. The wood benches and foot rests are brought back to life from barns that once occupied the site. Dion says he's always been passionate about healthy eating from being an athlete himself as a hockey player, wrestler and an avid Abby Grinder. His passion for healthy eating led him to create custom meals from soups, salads to entries. Dion says the food is local and all fresh, as we tried his recommendation - salad served with local produce and sausage. Dion says, "It is the new Kits," in reference to Vancouver's trendy Kitsilano district, in offering a gluten-free menu to a knowledgeable clientele. Brodeur's made me feel like I was home in Quebec with their Montreal style menu. It's a great place for carbo-loading before a hike or a long run. I couldn't resist ordering my favorite Quebec dish poutine along with Pierre's Cuban sandwich. Their specialty is Montreal smoked meat which is served in large portions. John had a half rack of ribs with Brodeur's barbecue sauce, which he devoured. Chef Jay Baker has about 20 years experience and the food dishes are a fusion blend of New Orleans and Montreal cuisine. En route to our overnight stay at the Brookside Abby, we drove by pristine farmlands which seemed to stretch for miles. It's a charming boutique inn on Chardonnay Lane that is close to local vineyards. The Brookside Abby was voted best small hotel in Canada by TripAdvisor for 2017 and their award list goes on. We stayed in the "Midnight in Paris" suite, which is themed after the romantic comedy about a writer, directed by Woody Allen. Each suite has a movie theme and is decorated with items based on the movie, such as an Underwood typewriter from the late 1920's in our suite, as well as other fascinating artifacts and paintings. Chris and Sandi, the owners told us "The items were to remind people of the movie theme. The movie is the central theme. All of that is Sandi's idea. She thought of which movie themes: Thomas Crowne Affair, Breakfast at Tiffany's. We are not aware of any other hotel like this in the world." We were treated the following morning to a homemade gourmet breakfast which was included in the stay. As a rather muscular action movie star might say, "We'll be back."